EASTVALE, CA--(Marketwired - Apr 3, 2015) - William Lyon Homes has recently announced plans for Nexus, an exciting new townhome community coming to the charming town of Eastvale. 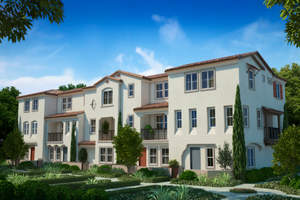 The brand-new, attainably priced collection will feature three-story designs with Spanish-inspired architecture, modern interiors and comfortable living spaces that will appeal to a range of buyers, from single professionals and couples to retirees seeking the convenience of attached living. With prices anticipated to start from the $300,000s, three open-concept floorplans now available to view online and exclusive recreational amenities, potential buyers are encouraged to join the Interest List at www.LyonNexus.com to get on the inside track for advance notice of first phase pricing and sneak previews. "We are very excited to introduce Nexus to homebuyers who are seeking a comfortable, low-maintenance lifestyle at attainable prices," said Ben Blomdahl, Director of Sales for William Lyon Homes. "We highly recommend that anyone interested in this exciting new-home opportunity to view floorplans online and register their interest now for important pre-qualifying information." Nexus' floorplans range from approximately 1,415 to 1,647 square feet, with 2 to 4 bedrooms; 2.5 to 3 baths; first-level dens in every plan and 2-car garages. All three attached designs feature flowing, open floorplans with large great rooms for entertaining; well equipped kitchens with islands in select plans; spacious master suites with walk-in closets; and covered decks accessible from the great room area. The excellent Eastvale location just off the I-15 offers convenience for residents with busy lifestyles and eases the burden of commutes for those heading to the area's major employment centers. The LA/Ontario Airport is also within close proximity for frequent air travelers and visiting out-of-town guests. Nexus homeowners will enjoy the ample shopping and entertainment opportunities in the area, including the popular Eastvale Gateway, a dynamic retail and entertainment destination that includes Edwards Cinemas; dining spots such as Chipotle and Habit Burger Grill; and stores and services that range from Target, HomeGoods and Sports Chalet to Vons supermarket, PetSmart, and Bank of America. An impressive number of recreational parks are found throughout Eastvale, including Cedar Creek Park with its playground, splash pad, barbecues and picnic shelters; the Harada Heritage Park, which features a variety of sports fields, barbecue areas, a playground, skateboard park and dog park; Riverwalk Park, which has the Cinder Running Track, Frisbee golf course, horse corrals and jogging/biking trails; and the Dairyland Park with its dog park and water play/splash pad areas. There are also plenty of options for golfers such as Jurupa Valley's award-winning Paradise Knolls Golf Course, Hidden Valley Golf Club in Norco or Whispering Lakes Golf Course in neighboring Chino. Interest list now forming for new Nexus neighborhood coming to Eastvale.